I've always enjoyed seeing bumblebees on and around flowers in gardens, with their majestic and sonorous flight. Since 2013 we have had bees regularly nesting behind an airbrick on the house wall just outside the back door. This aroused my curiosity even further, so I read some books and started learning to identify the different types. 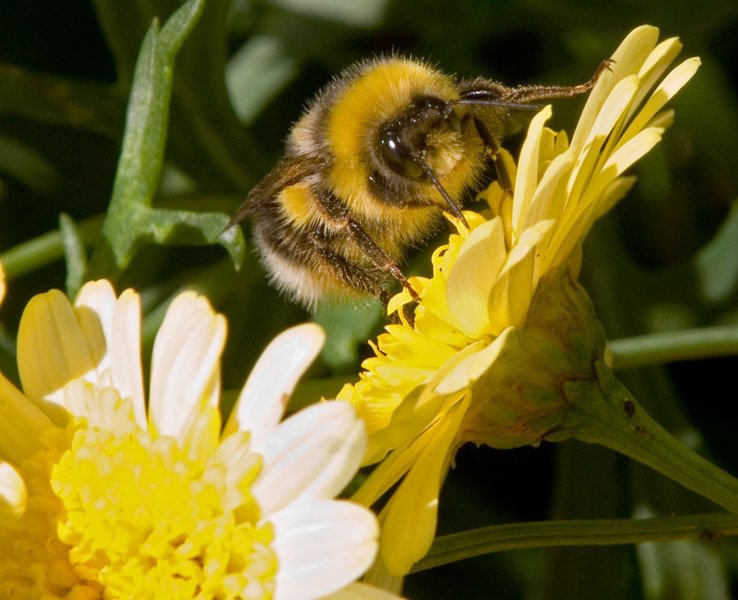 Bumblebees have been in decline in recent decades. This started with the changes to modern farming methods from the 1960s, with easy availability of fertilisers obviating the need for traditional crop rotation with some land left fallow, hedgerows being curtailed or replaced with bare fencing, and traditional hay-making being replaced by silage production for which the grass is cut down earlier in the season. 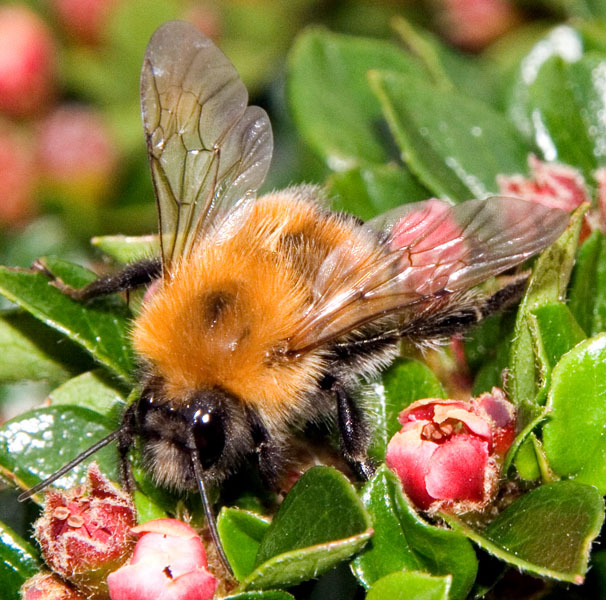 More recently climate change, increased transmission of pests across national boundaries and the increased use of pesticides, particularly neonicotinoids, in farming have presented further threats to bumblebees and other pollinating insects. 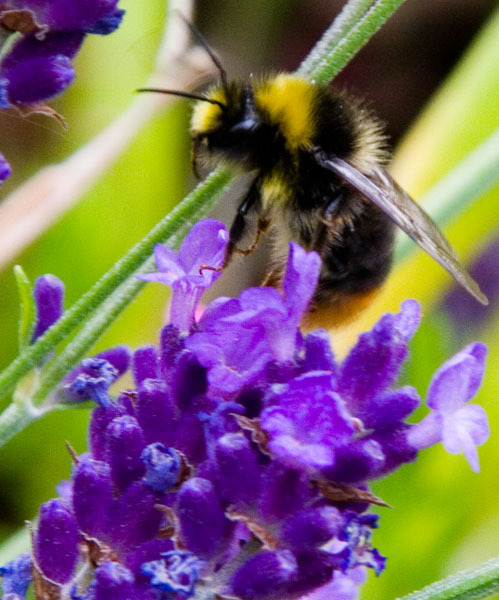 So in 2015 I joined the Bumblebee Conservation Trust, a charity whose mission is to promote the survival of these important pollinators and help ensure they are able to prosper again. 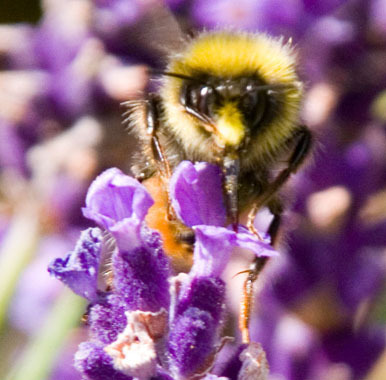 Thankfully, the need to protect bees and provide sufficient habitats and forage for them is now increasingly recognised: farmers have for a few years now been incentivised to provide areas of flower meadows around their fields, and there is an increasing push for local and transport authorities to provide bee-friendly habitats wherever possible, such as along roadside verges and railway lines. 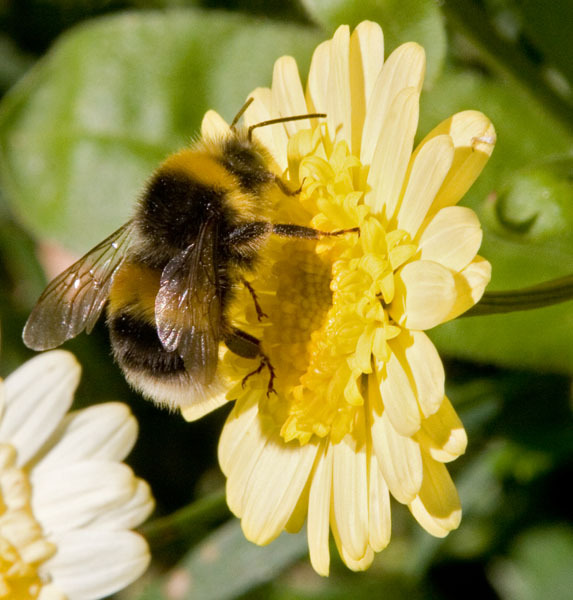 A lot of people don't realise how much we actually depend on bumblebees. Do you like tomatoes? 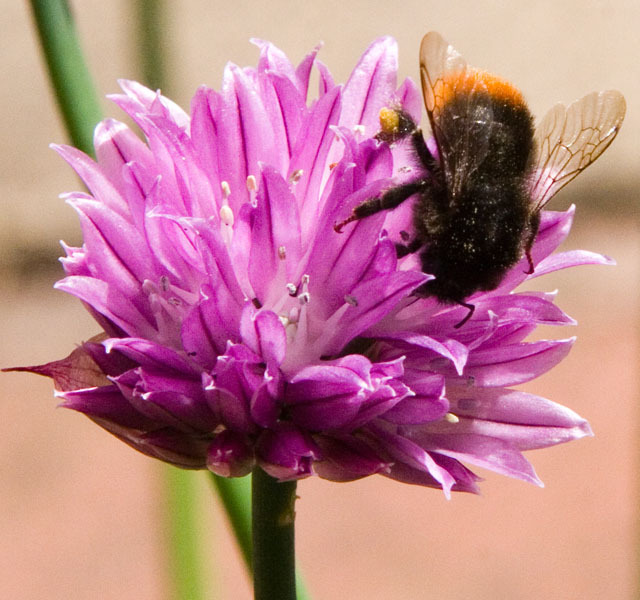 Bumblebees are crucial for tomato pollination as this requires a method called "buzz pollination" which only bumblebees can do. Though honeybees are also important - as well as the only source of honey we eat - they are not by any means the only species we need to ensure our crops are fully pollinated and can grow to give us food. 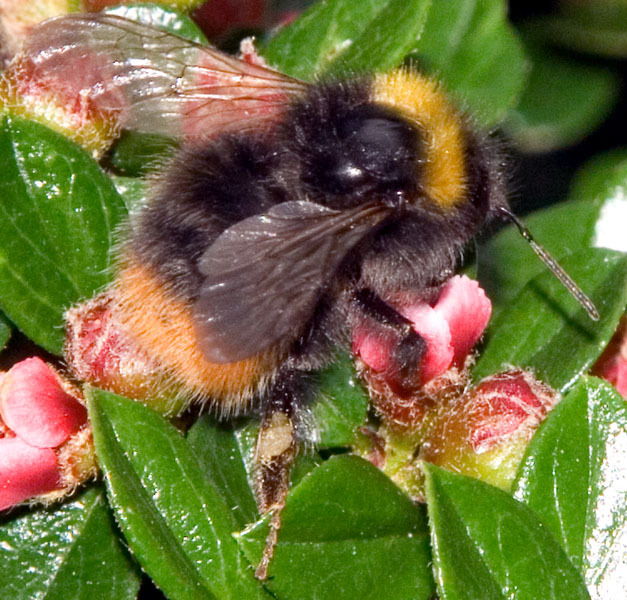 Many fruit and vegetable growers in fact now import bumblebees commercially from Europe to ensure their produce crops successfully! 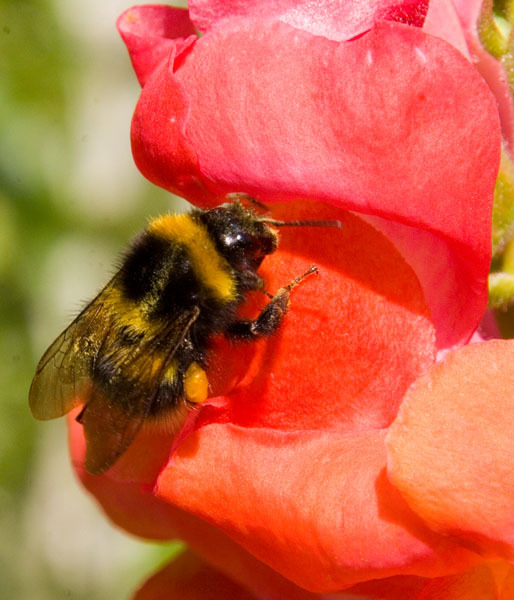 Bumblebees are social insects like honeybees, common wasps and ants. At the head of each colony is a queen who normally does all the egg-laying. Once her nest is up and going she is supported by a team of workers, also females but who don't normally lay eggs. 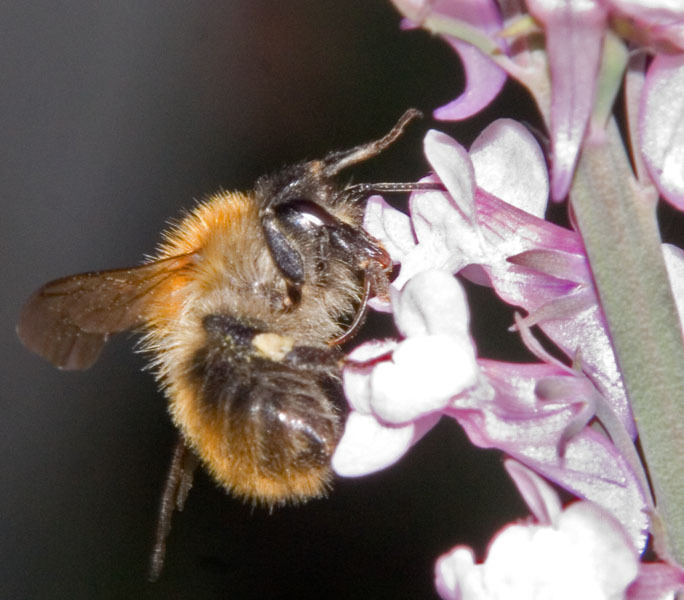 Male bees are only produced towards the end of the season. Female bees - queens and workers - can sting, though they are peaceful creatures who will normally never attack you unless you accidentally trap or squash them or closely disturb their nests. 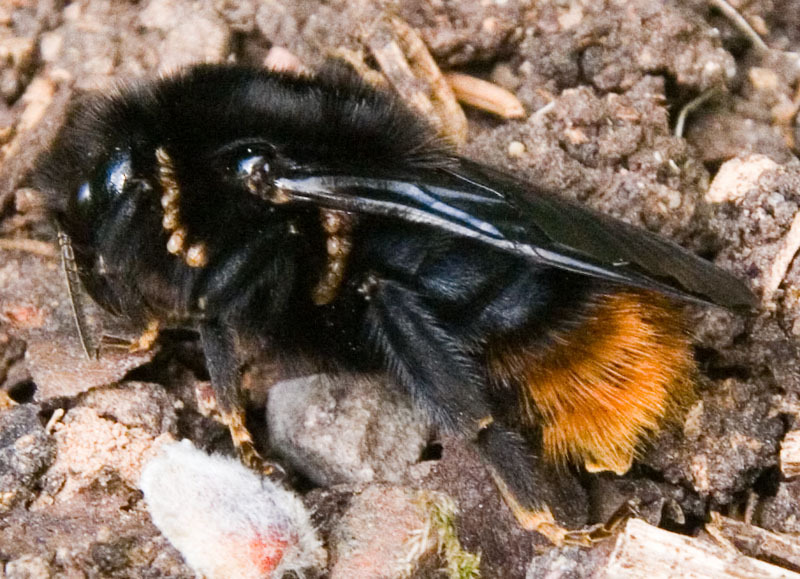 The one exception to this is the tree bumblebee, who will readily nest in house walls or bird boxes and may then attack people causing loud vibrations that are affecting their nests, for example when lawnmowing. Male bees are completely harmless to us as they do not have stings. Bees are totally vegetarian, feeding on nectar for energy and using pollen produced by flowers as their sole protein source. All bees have 'honey stomachs' where they can hold nectar, either for later consumption or to take back to their nests. Queens and workers also have pollen baskets on their rear legs so they can carry useful quantities back to the nests, where it is essential for the proper growth of their larvae. 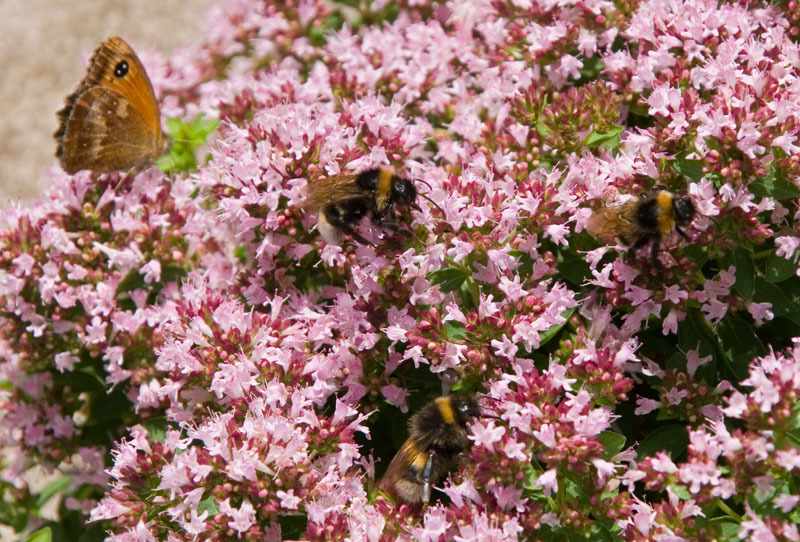 My Marjoram was teeming with bumblebees in 2013 - we'd had a very late spring so there were still plenty around when it flowered. 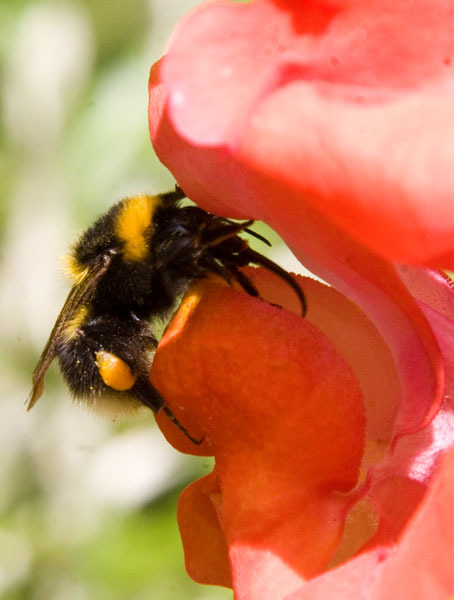 Compared to honeybees and wasps, bumblebee nests are short-lived, often fulfilling their purpose and then being abandoned within 3 or 4 months. Nests almost never persist through the winter - instead, newly reared queens mate with males and then hibernate, underground or in cracks in walls etc, before re-emerging the following spring to set about founding new nests of their own. After feeding on flowers to replenish themselves, the queens search around for suitable nest sites - you may often see them flying low-down over the ground in spring while doing this. After finding a suitable place, the queen collects an initial stock of nectar and pollen and then lays a batch of eggs over the latter. She then incubates and feeds her larvae until they pupate and, in due course, hatch into her first batch of workers. These first workers are often fairly small. Once the first workers have hatched they take over the task of foraging for food and many of the household chores, leaving the queen to concentrate on laying new batches of eggs. But the queen usually builds the egg cells herself and oversees them until they hatch into larvae. In this way, the number of worker bees in the nest steadily increases. A point is then reached where the queen starts laying male eggs, and from then on the remaining female eggs she lays grow into new queens. Sometimes some of the workers also lay some male eggs at this stage. Once hatched, the males leave the nest to find other new queens to mate with. Though the new queens readily fly about, they often remain based in the nest for a couple of weeks or so, sometimes helping to raise the remaining brood or with foraging. Having mated, though, they feed themselves up and soon either hibernate, or, in some species, if it's not too late in the summer they may start a second or third nest cycle. But there is one type of bumblebee that doesn't follow the above pattern. These are the cuckoo bumblebees whose females, as the name suggests, take over other bumblebees' nests. After killing or subduing the nests' original queen, they lay their own eggs and get the workers already there to raise these. 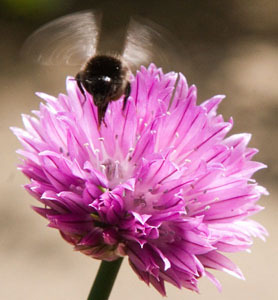 Cuckoo bees do not produce their own workers, and do not forage for food - they don't even have pollen baskets. The only offspring they produce are males and the next generation of cuckoo females, so the latter are usually just termed females rather than queens. 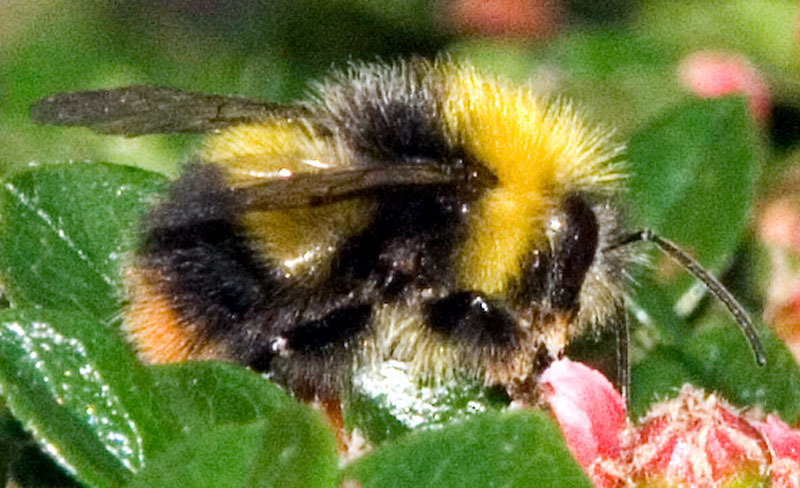 Each species of cuckoo bee generally takes over the nests of a particular kind of social bee, for example red-tailed cuckoo bees attack ordinary red-tailed bumblebees. 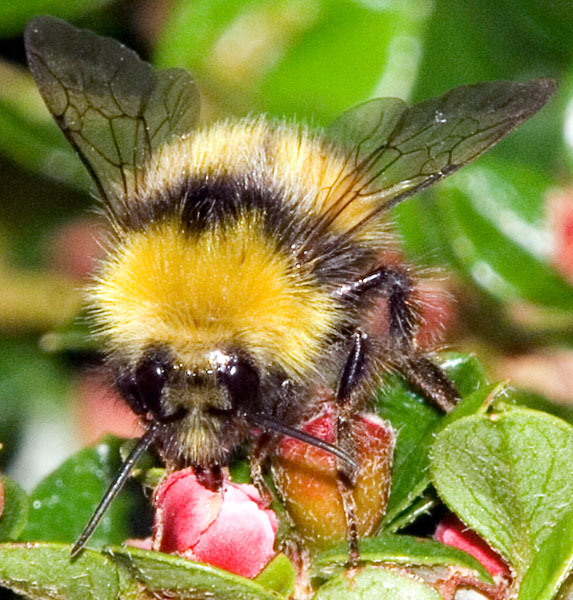 Bumblebees (in common with honeybees, wasps, ants and all the other hymenoptera family of insects) have a different system of genetics from us warm-blooded animals. Whilst the female insects, like ourselves, have two sets of chromosomes, and are said to be diploid, males only have a single set - they are haploid. Females' ovaries, again like ours, produce eggs with just one set of chromosomes. When a queen (or cuckoo female) mates, she stores the male's sperm in a special storage organ called her spermatheca, where it remains viable for many months. When she lays an egg, she can choose whether or not to fertilise using this stored sperm. If she does, the egg grows into a female - a queen or worker in the case of a social species. But if she doesn't, the egg will still grow and develop into a male. If a worker bee lays eggs, she has no sperm to fertilise them with, so they will all grow into males. Thus only the queen can raise female offspring. A further bizarre consequence of this system is that male bees have no fathers, but do have grandfathers! It is also the case that all of a male's sperm are genetically identical. A queen of the common buff-tailed bumblebee, with her familiar yellow stripes - one at the front of her thorax and one a little way down her abdomen. Buff- and white-tailed queens and workers are not so easy to distinguish, as they have similar markings with both types of worker having white tails and even the tails of buff-tailed queens sometimes being white. White-tailed males, however, can be clearly identified by their yellow facial hairs. 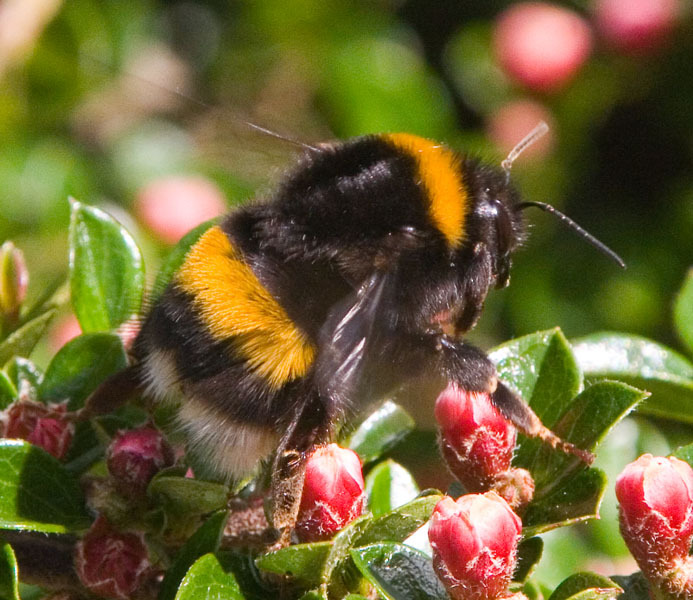 A useful tip to know, in fact, is that any British bumblebee with black and yellow stripes that also has yellow hairs on his face is always a male bee (though not all male types have yellow faces). 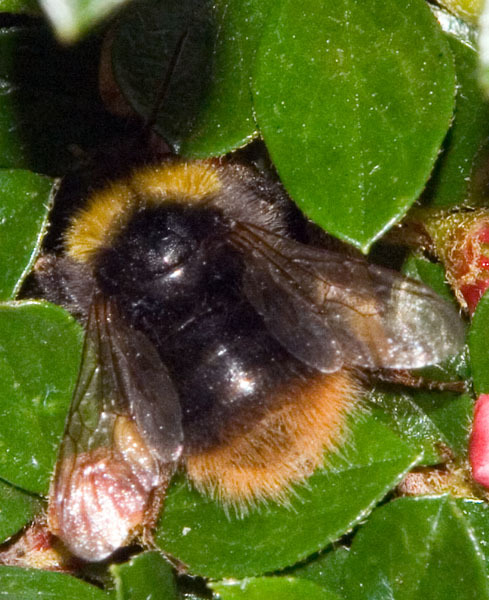 There are actually three separate, though closely related, species of white-tailed bees, but these are often grouped together and just described as white-tails or B lucorum. 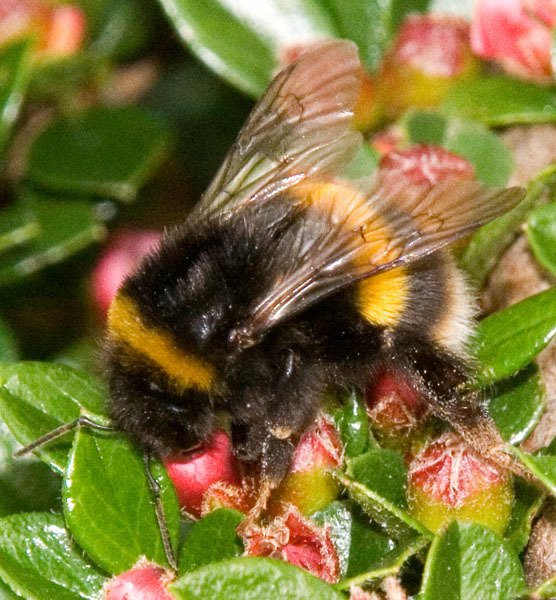 Red-tailed bumblebees are also quite common. Here is a red-tailed worker on my chives. Queens and workers both have black thoraxes and abdomen with their distinctive red/orange tails. This view highlights just how much pollen these bees can carry in the baskets on their hind legs. 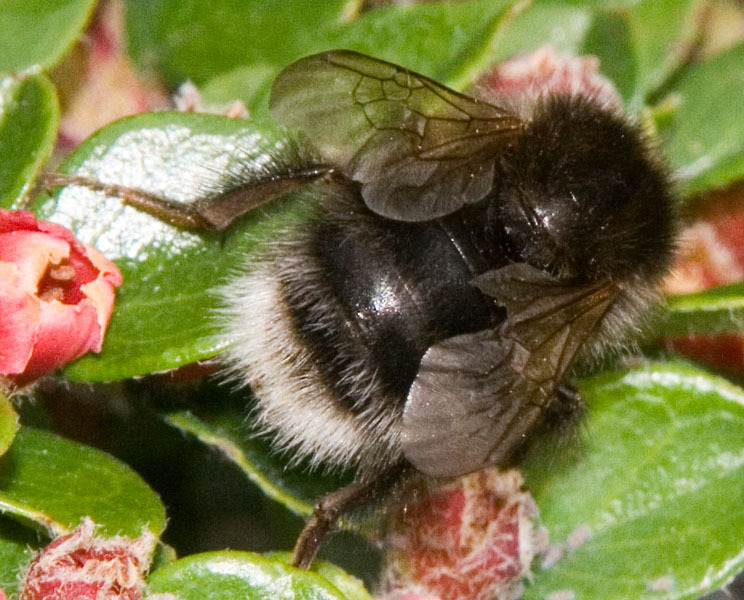 Only females (queens and workers) of social bumblebee species carry pollen on their hind legs. Males leave their nests for good as soon as they can fly, thereafter fending for themselves only, and cuckoo females depend on the efforts of the existing workers of the nests they've taken over. A male. These can be distinguished quite easily from the females as they have yellow stripes on their bodies and very noticeable yellow hairs on their faces. 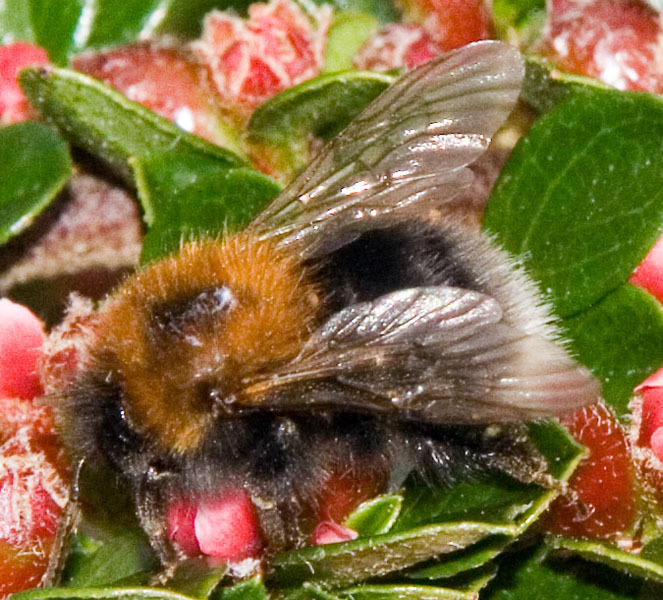 A tree bumblebee on my Cotoneaster. These are the type who have been nesting behind my air brick. Queens, workers and males all have the same basic colour pattern: a chestnut/brown thorax and the abdomen all black but for a white tail, though some minor colour variations do occur as we shall see in a moment. The first brood of workers produced by a nest can be quite tiny, but later ones and males are about the same size, so it's hard to tell them apart unless you can look very closely. Queens are easy to identify as they are visibly bigger. One of the less common colour variations is that the thorax can also be all black. 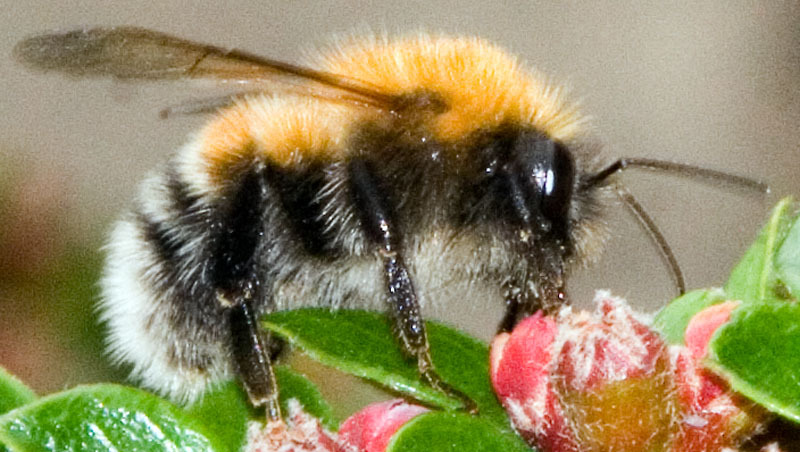 This shows possibly the other end of the scale of colour variations: the brown is quite light and extends onto the first two segments of the abdomen, and the bee has rings of white hairs above the white tail. Common carders are quite distinctive from the other common types as they have no colour banding. They are often covered in yellow hairs all over, though the hairs are commonly thin so that the black chitin of their exoskeletons can be seen clearly through it. They are also noticeably smaller than the other types, with the workers looking like slightly short and fat honeybees. 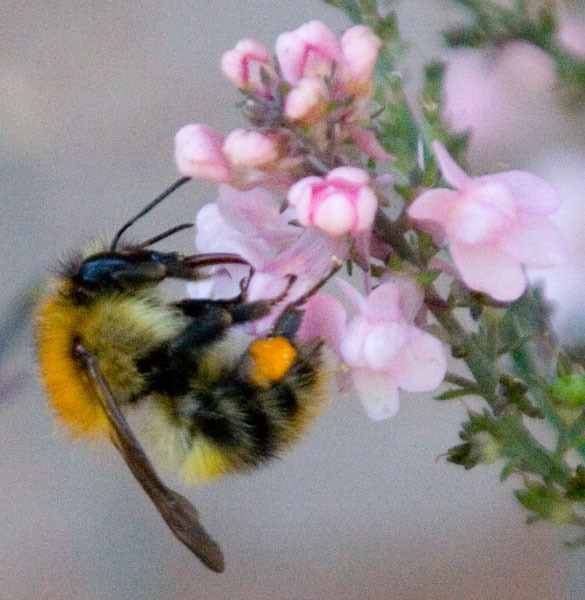 Early bumblebee workers typically have a yellow stripe at the front of the thorax and then just an orange/yellow tail, the latter not as reddish as of red-tails. Males have the same orange tails but their upper bodies are visibly much more yellow. These also have distinctive yellow "moustaches". Ironically, despite their common name I haven't seen very many of these bees in my garden, but I did manage to spot and photograph this queen on my snapdragons. Their distinctive markings are having two yellow bands on their thorax and then a third one on the abdomen, with a white tail. They also have pretty long tongues so can drink from nectaries set quite deep in flowers. I've seen red-tailed cuckoo females in my garden two or three times, but only had the chance to take photos on this one occasion, when a bee newly emerged from hibernation was crawling around in my flower border. 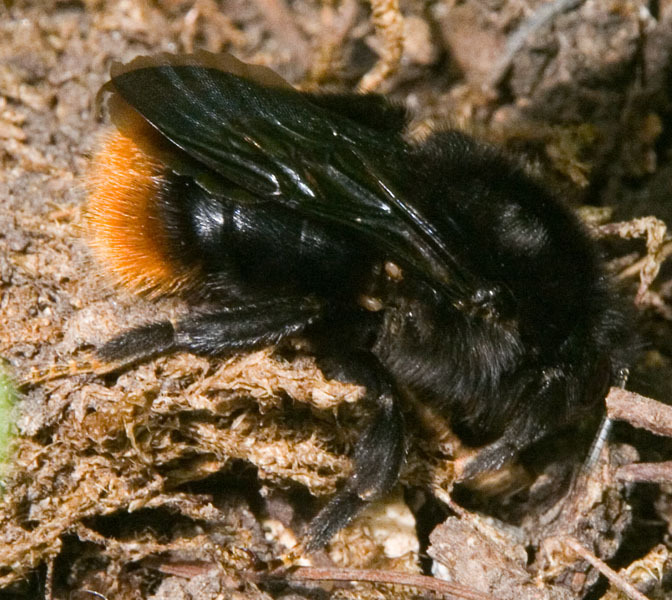 Superficially she resembles a red-tailed queen, but there are no pollen baskets on her hind legs, the black hairs on her abdomen are thinner with the chitin underneath more readily visible, and she has dark, smoky-coloured wings. Unlike the Varroa mites that afflict honeybees, the mites around her thorax are not harmful. They are scavengers hitching a ride until she arrives in a nest, at which point they will drop off her and start tidying up the surplus debris. 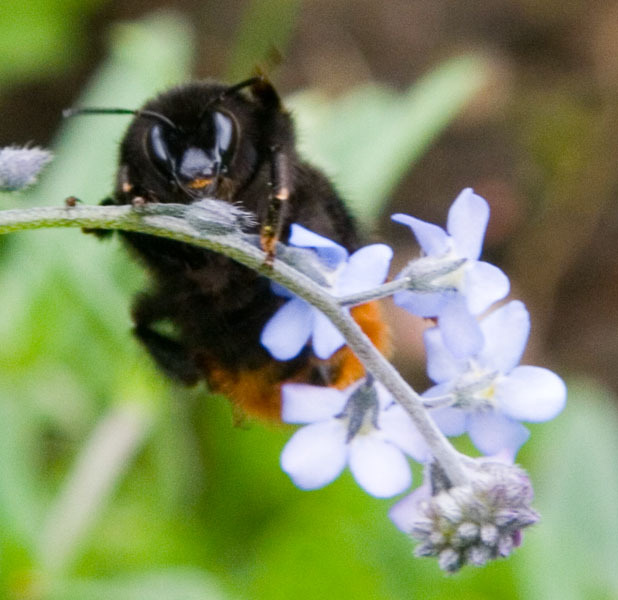 The Bumblebee Conservation Trust (BBCT) is the leading UK organisation devoted to bumblebees, and hosts a discussion forum on its website. There is also an open BBCT discussion group on Facebook. 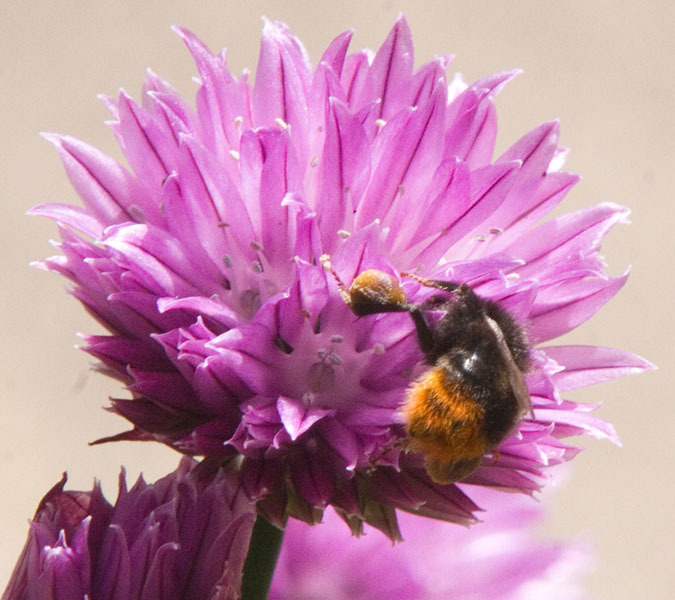 There is a useful guide to identifying British bumblebee species on the National History Museum website. The Bees Wasps & Ants Recording Society (BWARS) is dedicated to studying all types of bees, wasps and ants in Britain and Ireland. 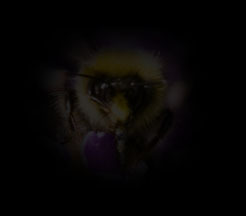 www.bumblebee.org is also packed with useful information about bumblebees.